(Nanowerk News) New data obtained by NASA’s GRAIL mission reveals that the Procellarum region on the near side of the moon — a giant basin often referred to as the “man in the moon” — likely arose not from a massive asteroid strike, but from a large plume of magma deep within the moon’s interior. The Procellarum region is a roughly circular, volcanic terrain some 1,800 miles in diameter — nearly as wide as the United States. One hypothesis suggested that it was formed by a massive impact, in which case it would have been the largest impact basin on the moon. Subsequent asteroid collisions overprinted the region with smaller — although still large — basins. Now researchers from MIT, the Colorado School of Mines, and other institutions have created a high-resolution map of the Procellarum, and found that its border is not circular, but polygonal, composed of sharp angles that could not have been created by a massive asteroid. 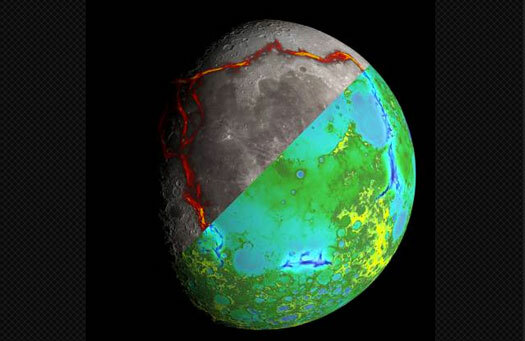 Instead, researchers believe that the angular outline was produced by giant tension cracks in the moon’s crust as it cooled around an upwelling plume of hot material from the deep interior. Zuber and her colleagues publish their results this week in the journal Nature("Structure and evolution of the lunar Procellarum region as revealed by GRAIL gravity data"). The team mapped the Procellarum region using data obtained by GRAIL — twin probes that orbited the moon from January to December 2012. Researchers measured the distance between the probes as they chased each other around the moon. As the leading probe passed over a region of lower density, it briefly slowed, caught by that region’s gravitational pull. As the probes circled the moon, they moved in accordion fashion, the distance between them stretching and contracting in response to varying gravitational attraction due to the mass variations in the lunar interior. 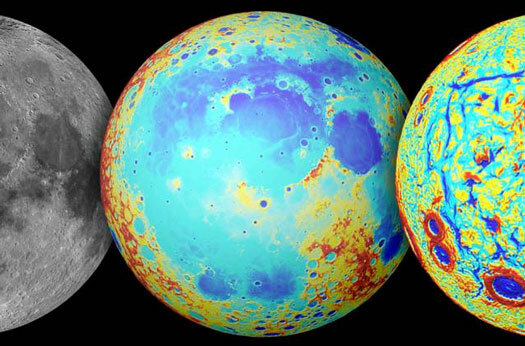 From the variable distance between the probes, Zuber and her team determined the strength of gravity across the moon’s surface, creating a highly detailed map, which they then used to determine where the lunar crust thickens and thins. From this mapping, the researchers observed that the rim of the Procellarum region is composed of edges that abut at 120-degree angles. As asteroid impacts tend to produce circular or elliptical craters, Zuber says the Procellarum’s angular shape could not have been caused by an impact. Instead, the team explored an alternative scenario: Some time after the moon formed and cooled, a large plume of molten material rose from the lunar interior, around where the Procellarum region is today. The steep difference in temperature between the magma plume and the surrounding crust caused the surface to contract over time, creating a pattern of fractures that provided a conduit for molten material to rise to the surface. To test the hypothesis, the researchers modeled the region’s gravitational signal if it were to contain volcanic intrusions — magma that seeped up to just beneath the moon’s surface and, over time, cooled and crystallized. The resulting simulation matched the gravity signal recorded by GRAIL, supporting the idea that the Procellarum was caused by a magma plume, and not an asteroid. Ultimately, proving that the moon may have harbored an ancient plume may require a new lunar mission, involving a long-lived geophysical network to monitor seismic and heat signals from the deep interior, according to Clive Neal, a professor of civil and environmental engineering and earth sciences at the University of Notre Dame.